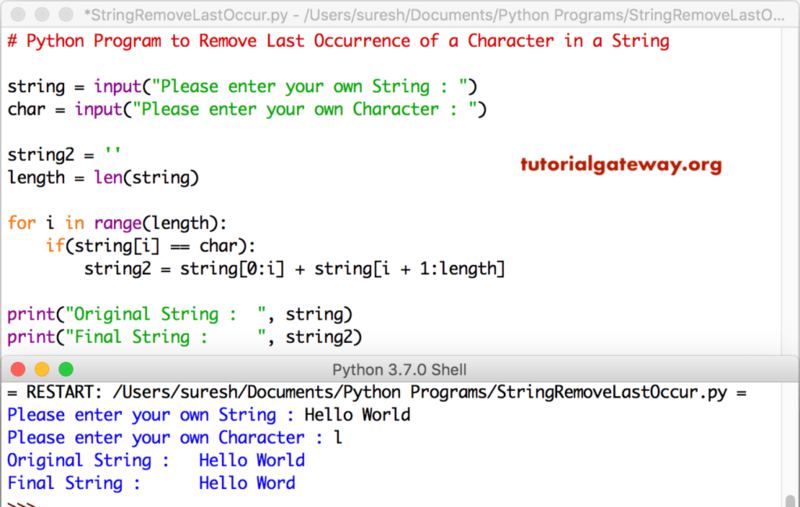 In this article, we will show you, How to write a Python program to Remove Last Occurrence of a Character in a String using For Loop, while loop, and functions with example. TIP: Please refer String article to understand everything about Strings. This python program allows the user to enter a string, and a character. Next, it will find and remove last character occurrence inside a given string using For Loop. First, we used For Loop to iterate characters in a String. Inside the For Loop, we are using If Statement to check whether the character is equal to ch or not. If true, it use the string slice index to remove that character. NOTE: Even though, if it find multiple matches, it will until it find the last character. Because, we are not using Break statement to exit from loop. This remove last occurrence of a character program is same as above. However, we just replaced the For Loop with While Loop. This program is same as first example, but this time we used Functions concept to separate the logic.